I have a new obsession. I love to collect things. Sometimes not just baseball cards, and I usually have to curtail a collection before it starts so it doesn’t get out of hand. Pop Funko Vinyls : I’ve had to limit them to just the Supernatural ones. The boxes are not small and can add up after just a few purchases. Hallmark itty bittys: I refuse to buy one even though I want ALL of them. Then Topps began making oversized cards to sell on its website. I held off on buying the wall art – 10x14 passes my thresholds. Now we’re talking posters (which was a problem I had in college and have since been on the poster collecting wagon). But these 5x7 oversized sets have got me hooked. I received a six-card pack at the start of the baseball card season when Topps created a “media pack” that featured Clayton Kershaw, Madison Bumgarner, a few other players, and some dude named Derek Jeter. They were just a 5x7 version of the 2015 Topps Series 1 base cards with the full back. These were unnumbered, but I think just 100 of these packs were made. 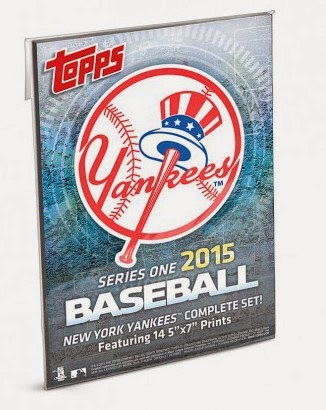 A short while later, Topps released the team sets of these on its site. I loved the way the Jeter from the media pack looked, and my finger clicked order. The team sets were numbered to just 99 copies. I controlled myself for just a little while and then Topps created the Cardboard Icons collection. It features a pack of 5x7 cards of every Topps cards from that player’s career. It started the collection with Derek Jeter – and I ordered a pack of the regular set numbered to 199. I let the Gold Edition numbered to 49 go. Then, last week, Topps released a 1952 Tribute team set … with one retired star in each of the team sets. Of course, it was Jeter for the Yankees, and, of course, I made a purchase. I work for Topps and this post could definitely seem like a plug, but I have to pay for my sets of cards just like anyone else. If I didn’t like them, I wouldn’t spend my money on them. But, spend my money, I have, and now I have a new collection of 5x7 Jeter cards. One step closer to being a hoarder. I bought the Griffey Cardboard Icon 5x7 set, one black and one gold. The gold set was missing the 2004 card and in its place was a card with the 2005 card back printed on both sides. The black set was fine. Have you heard of this? No. That's weird. I'll let someone know. Have you seen the new 52 Tribute wall art. Is there any thing printed on the backs of either size? I THINK they have typical card backs. But I haven't gotten mine yet. I will let you know when I do. I really like these limited 5x7 set. Hopefully they'll make an Icons set of Gwynn. As for those itty bittys... they're normally not my thing, but my niece bought me the Yoda and I absolutely love it. I've seen those Pop Funko Vinyls, wasn't going to buy any, but.... when I saw they are coming out with Big Trouble in Little China. I just have to get a Jack Burton. Who? Jack Burton, that's who. Pretty cool stuff. I used to collect so much, but I had to back off cause my house was being filled. So just cards for me now.